Gallup this week released 2017 job approval ratings for President Trump in all 50 states. There’s a lot of interesting stuff in there. But one data point seemed to catch people’s attention more than others: Trump managed only a 39 percent approval rating in Texas; 54 percent of Texans said they disapproved of Trump. Those numbers are pretty bad — worse than his ratings in Nevada and Arizona, more typical battleground states. 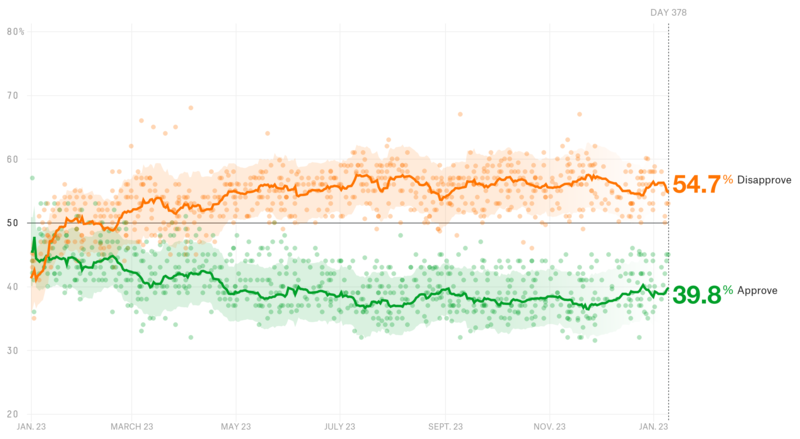 Indeed, Trump’s net approval rating (approval rating minus disapproval rating) in ruby-red Texas (-15 percentage points) was essentially the same as his net approval rating nationally (-18 points). Take these numbers at face value and it’s difficult not to conclude that Ted Cruz, the Republican senator from the Lone Star State who is up for re-election this year, could be in a surprising amount of trouble against his Democratic challenger, Beto O’Rourke. But should we take these figures at face value? It’s possible that O’Rourke and Cruz may end up in a close race, but I’d be cautious about using the Gallup numbers to argue that Cruz might lose. The reason is simple: The group of people Gallup is polling is the entire adult population, rather than registered or likely voters. And in Texas, there’s a big partisan gap between the adult population and the electorate. Nationally, voters, as a group, typically lean a bit more Republican than the adult population.1 But Texas is a special case: The electorate tends to be way more GOP-leaning than adults overall are. You can see this at work in polling that Marist College did of likely voters and all adults in nine states during October and November of the 2016 campaign.2 When Marist asked whether respondents approved or disapproved of then-President Barack Obama, it found, on average, a 5-percentage-point drop in Obama’s net approval rating when the population changed from adults to likely voters. In Texas, the decline was 13 percentage points — by far the largest of the states polled. In other words, the likely electorate in Texas was 13 points more GOP-leaning than the state’s overall adult population. *Data is from the final survey conducted in the state. Why the difference? In short, the answer can be found in the ethnic and racial makeup of the adult and voter populations. Whites are more Republican-leaning than nonwhites, so the more white an electorate is the more Republican it will likely be. According to the U.S. Census Bureau’s Current Population Survey, non-Hispanic whites made up 47 percent of all Texas adults in 2016 but accounted for 61 percent of Texans who voted that year. The only other states with a gap that big were California and Arizona, which also had 14-point differences and have large Hispanic populations.3 That’s double the average gap (7 points). But Texas is different from Arizona and California in an important way — it has a larger partisan gap between whites and nonwhites, which exacerbates the effect of the ethnically/racially-driven differences between all adults and voters. White voters in Texas are far more Republican than white voters in Arizona and California are.4 So, that Texas’s electorate is so much whiter than its adult population has a huge effect. None of this is to say that O’Rourke can’t or won’t beat Cruz. Cruz’s polling shows him ahead of O’Rourke by 18 percentage points. But it also found Cruz’s net favorability rating at just +8 points, which suggests that the race could tighten. Also, O’Rourke is a strong fundraiser. And Texas might not be as red as it used to be — in 2012, Mitt Romney beat Obama there by 16 points; in 2016, Trump beat Clinton by 9. Still, Cruz is likely to face an electorate that is far friendlier to Trump and Republicans than the Gallup numbers suggest. YouGov found that 38 percent of adults always see the same person for a haircut. Among those 55 and older, the number is 48 percent. Among those 18 to 24 years old, it drops to 25 percent. A 1984 Society survey of a potential Ohio governor’s race matchup shows Republican Mike DeWine leading Democrat Richard Cordray 49 percent to 28 percent. Gallup found that 78 percent of Americans are satisfied with the U.S. military’s “strength and preparedness,” and 63 percent are satisfied with “the nation’s security from terrorism.” Both of those numbers are up from 2017. 70 percent of State of the Union viewers rated Trump’s speech positively in a CNN poll, the least positive reaction for a speech of its kind in at least 20 years. Just 13 percent of Americans told YouGov that the FBI should be loyal to the president, while 73 percent said the FBI should be independent from politics. Ahead of the March Democratic gubernatorial primary in Illinois, a We Ask America poll put J.B. Pritzker at 30 percent, Daniel Biss at 17 percent and Chris Kennedy at 12 percent. Just 53 percent of millennials in a University of Chicago survey said elections can produce real change in America; meanwhile, 75 percent said community groups could produce change. According to the Pew Research Center, a majority of Americans believe the government doesn’t do enough for young people, old people, poor people or middle-class people. But only 5 percent said it doesn’t do enough for wealthy people. The vast majority of registered voters (90 percent) told Quinnipiac University that it is important for a president to be a good role model, although only 29 percent believe Trump is one. 63 percent of Americans told Gallup that artificial intelligence will widen the gap between rich and poor. Trump’s job approval rating is at 39.8 percent, while his disapproval rating is at 54.7 percent. Last week, his approval rating was 39 percent, compared with a disapproval rating of 56 percent. 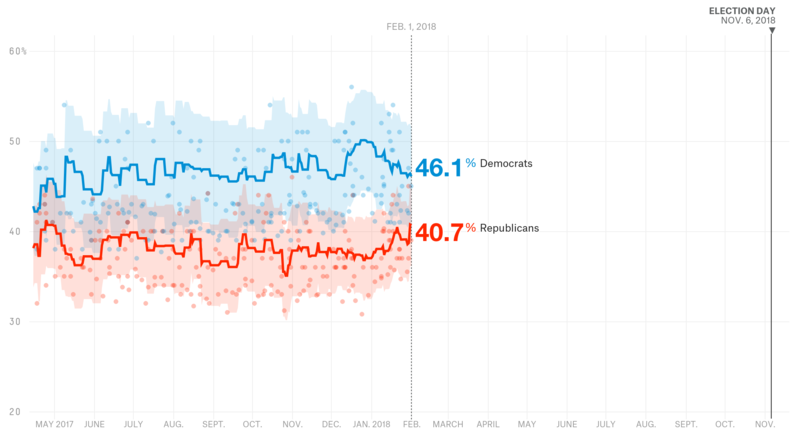 The Democrats’ hold a 46.1 percent to 40.7 percent advantage on the generic congressional ballot this week. That’s down from last week, when the Democrats were up 46.4 percent to 39.1 percent. Many demographic groups that tend to vote Republican — older voters, white voters, etc. — also tend to turn out at higher rates than more Democratic-leaning groups. Marist polled some states twice. I’m using data from the final poll conducted in each. Like Gallup, Marist uses random digit dialing and calls cellphones. More than 25 percent of the adult Hispanic populations in each of these three states are not citizens, which means they can’t vote. According to the 2016 Arizona exit polls, Hillary Clinton beat Donald Trump by 27 percentage points among nonwhite voters, and Trump beat Clinton by 14 points among white voters. That’s an absolute difference of 41 points. In California, the gap was similar, 47 points. But in Texas, it was 80 points. (Nationally, the gap was 73 points.) The big divide in Texas is driven mostly by white voters, whom Trump won by 43 points. He won white voters by 20 points nationally and by 14 points in Arizona. In California, he lost white voters by 5 points.